You are here: Home » Craig Thomson conspires with ALP member Peter Wicks to harass, intimidate and stalk key witness Kathy Jackson and her children. Craig Thomson has been colluding with ALP member and former state candidate Peter Wicks who has been using the internet in an attempt to harass, intimidate and stalk Kathy Jackson which includes her children, in Mr Thomson’s fraud matters. This is a criminal offence under section 36A of the Crimes Act 1914 “Intimidation of witnesses etc” and a clear breach of section 474.17 of the 1995 Criminal Code: Using a carriage service to menace, harass or cause offence. Their conduct would also likely breach other laws such as attempting to pervert the course of justice. Publisher of the internet site Independent Australia, David Donovan, is also involved in these crimes. Chris Brown the acting president of the Health Services Union also has plenty of questions that he needs to answer. In preparing and researching this post a Craig Thomson / Peter Wicks supporter made a death threat against Kathy Jackson and me in the comment section of my previous post which I will deal with later in this post. Peter Wicks is an ALP member, former candidate and has been in regular close contact with Craig Thomson and with other ALP members on a regular basis. He has also told me that he is a possible future candidate for the ALP. He refers to himself as an investigative blogger. He publishes on his own site which he calls Wixxileaks which does not get much traffic and recently also on Independent Australia which gets more traffic. Peter Wicks has been publishing articles with leaked documents that he alleges show fraud or possible fraud by Kathy Jackson. Kathy Jackson is a key witness in relation to up and coming legal proceedings against Craig Thomson and was involved in a court matter when Peter Wicks started publishing his posts on Independent Australia. 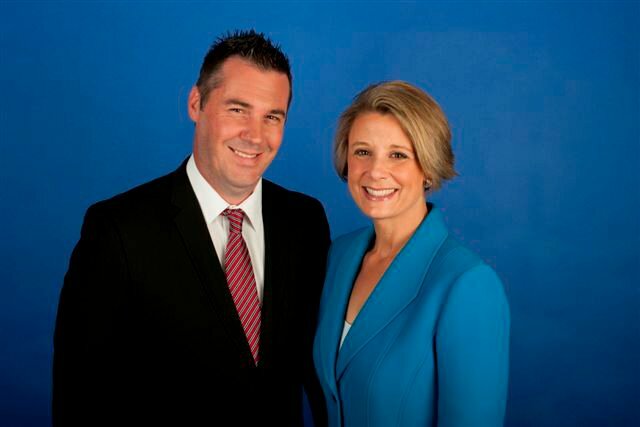 Peter Wicks and former NSW Premier Kristine Keneally. Photo is probably taken sometime around the state election in 2011 when Mr Wicks was an ALP candidate. Peter Wicks is well aware that Kathy Jackson is a witness against Craig Thomson and mentions this in his posts. Even if his evidence does show fraud by Kathy Jackson his actions have undermined any prosecution of Kathy Jackson given he would be a witness and has no credibility because of his actions. David Donovan (IA publisher) has a past as a journalist and should and would know better. But one can only assume that given the website Independent Australia has been struggling he decided to run the posts by Peter Wicks to boost readers which it has. Or maybe Mr Donovan has been paid. But this makes David Donovan as guilty as Peter Wicks. What is most sickening is that Craig Thomson and federal Labor politicians recently went on a campaign to pressure the media to leave Craig Thomson alone or he might be driven to suicide which has worked as the media have dropped off. Yet they have gone on a campaign against Kathy Jackson using online media even though she did try to commit suicide last year when the pressure got too much. This was not long after someone had left a dirt covered shovel at the front of her house implying that she should start digging her own grave. A clear death threat. Peter Wicks says he has passed on all the material he has to the NSW and Vic Police. So why did he start his online campaign against Kathy Jackson? Well it is clearly to harass, intimidate and stalk. “SOMETIMES, it is only when you see a person in real life that you have a full appreciation of them. I had often wondered why Kathy Jackson seemed to be able to charm so many seemingly intelligent men. When I say intelligent, I am not referring to Tony Abbott, of course. I am in Sydney’s Federal Court to see the final showdown between Jackson and Justice Flick. Standing outside the courtroom, I see Jackson for the first time, she is talking to some men. She looks absolutely radiant, I have to say. She has an air about her that is hard to define. Her eyes radiate warmth, her skin has a flawless quality and every move seems to be done with such grace. I instantly understand the attraction. Just then, a lady walks past and drops her purse, Kathy gracefully stoops down, picks it up and hands it to the lady with a smile that would make your heart melt. I think his comment says it all where he stands in relation to Craig Thomson and Kathy Jackson. Peter Wicks posts are riddled with harassment and intimidation of Kathy Jackson while defending Craig Thomson. There has been no criticism of Craig Thomson in Mr Wicks posts. In fact Peter Wicks tries to defend Mr Thomson and quotes some of the lies Mr Thomson has told as being true and correct. Apparently he is innocent. Peter Wicks told me on the phone that there had been 11 enquiries that had cleared Craig Thomson of any wrong doing. That’s right, there is no evidence against Mr Williamson or Mr Thomson according to “investigative blogger” Peter Wicks. The evidence against Craig Thomson and Michael Williamson is a mile long and has been all over the media. Does any sane person who has followed the matter really believe they are innocent and there is no evidence? Funnily enough last Friday some 5 days after I had spoken and emailed questions to Mr Wicks he managed to find some evidence against Michael Williamson. Not much though. I put some questions to Peter Wicks by email and he was quick to respond I must give him that. The questions and answers with Peter Wicks. I am happy to answer any questions on the case, however I have to wonder why you are so interested in my business and my private conversations, as they have nothing whatsoever to do with you, or your site. However, in the spirit of being transparent, I have answered all of your questions, even the irrelevant personal questions. My answers are in bold red inside your email below. Contrary to right wing rumour mongering, I do not know Michael Williamson, I am not from Labor’s right, nor am I a “Dark Force” of any kind. I have never proclaimed Thomson’s innocence, nor Williamsons, all I have done is provide documents to the public and the police that have been made available to me. If these documents mean that an investigation is warranted into the matter, as my readers, the NSW Police, and the Victorian police do, then so be it. What still puzzles me, is that a small minority group think that I have done wrong by uncovering information that warrants 2 police investigations. I would have thought that most honest people would appreciate any wrong doing, or alleged corruption exposed. Many have told me to go after Williamson, I would gladly if someone would give me evidence, rather than opinions and rumours. The same goes for Thomson. I hope my answers are to your satisfaction, if you have any more questions that are not of a personal nature, please feel free to send them to me. 5. Have you ever called Craig Thomson or does he always call you? I have called him sometimes. Kathy Jackson will not speak to me, Michael Lawler has not returned my call. And Marco Belano would not accept my phone number, if they did, I would speak to them as often as they would like also. 16. In one post you name the children of Kathy Jackson’s partner Fair Work Australia vice president Michael Lawler. Why did you feel the need to name the children when you could have done the post without naming them? A. Firstly, they are no longer children. If I was to make an allegation without proof, I would be threatened legally, luckily for me, the truth is a valid defence. That is why I chose to back my story up with evidence I did not involve the children in this, whoever chose to pay them with members funds did. Without showing the names on the payslips they could have been anybody’s payslips. I sent three follow-up questions with the answers to two of no interest but one was. Q. Have you met Craig Thomson face to face? A. I met Craig once at a meeting set up by a main stream media outlet that I am not at liberty to discuss. I must stress, the media outlet set up the meeting, not myself or Craig. That was last week and was the only time we have met. I have met Kathy Jackson just as many times. Dissection of Peter Wicks answers. If you look at Q and A 2, 3, and 4 Mr Wicks is clearly lying. He says he could not send the documents to Mr Lawler or Mrs Jackson because he could not contact them. But he says in relation to Mr Thomson “No I did not know him, I contacted his electoral office and sent a copy of the documents to his receptionist”. Mr Wicks knew where Mr Lawler and Mrs Jackson worked and could have sent copies there but did not. At Q1 Peter Wicks says he has spoken to Craig Thomson a few times but does not keep a tally. That is code for a lot but I do not want to say. If he had spoken to him 2,3,4, or five times he would remember and say so. Go to question 5 and Peter Wicks says he has called Craig Thomson sometimes. Not 1, 2 or 3 times but “sometimes”. These are 2 people in regular contact. Go to question 6 where he says what they chatted about they are clearly very chummy. At Q8 Peter Wicks says in relation to whether or not he will run for parliament again “I don’t know, it depends on whether I’m asked or not.” Well if he can help take down Kathy Jackson he will be a legend in ALP circles and highly likely be offered a safe seat or senate seat at a future election. Given he may decide to run again is a further reason he should not be doing what he is and is hardly impartial. Peter Wicks is in a very similar position as Mal Brough in the Peter Slipper case. Working behind in the shadows for their own benefit. At Q9 Peter Wicks had coffee with Chris brown, the acting national president of the HSU after Justice Flick had handed down his decision which Chris Brown supported and clearly not a friend of Kathy Jackson. Given that Peter Wicks was leaked the documents from the HSU Chris Brown would have to be a prime suspect. I notice Chris Brown has not said they will investigate where the leaks have come from, instead he decided to have coffee with the person who has been publishing the leaks. At Q16 he tries to justify naming Michael Lawler’s children. When I asked the question I did not know he had named Kathy Jackson’s 11 year old son and 16-year-old daughter. I wonder what his justification will be for that? The reality is there is none and that is why I did not send him a follow-up question asking why. Peter Wicks says the leaked documents come from a friend of a friend who works at the Health Services Union. He says they contacted him because he was an ALP candidate and runs a blog and he might know someone in the media. How many people run a blog? They clearly contacted him because they knew he was a good ALP member and would be stupid enough to do what he has done. He says he is not paid by the ALP but has spent an enormous amount of time on this. Maybe he is being paid by someone else. Or maybe he sees this as a way of getting a safe seat at a future election or a safe senate spot. This is not the first time the ALP has acted in this way. Remember the Australia Day riots where a staff member from Julia Gillard’s office had a union official lie to the Aboriginals to try to incite a riot against Tony Abbott. 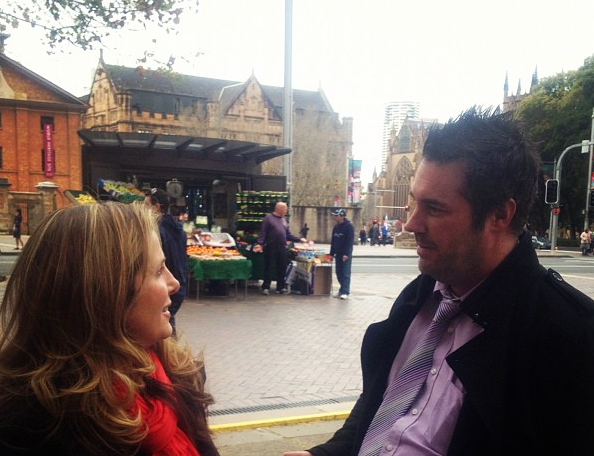 Peter Wicks stalking Kathy Jackson outside the Law Courts Building in Sydney. This was after he had named her children online. What a sicko Peter Wicks is. In none of the posts he does on Kathy Jackson does he acknowledge his Labor Party connections. In fact it says “Investigative blogger Peter Wicks” on the home page they have set up for the series and on other posts in the series. This is clearly deliberate to fool the reader into believing he is independent. “I find it delusional in the extreme to compare the clicking of a mouse button twice by Thomson to the more than two years of media harassment of Thomson, his family and staff.” This statement might explain to some degree why Peter Wicks has gone so hard after Kathy Jackson’s family. Peter Wicks takes the television reporter claim by Craig Thomson as being fact when the evidence does not support it. Why did Craig Thomson not raise it at the time or go to the police? Peter Wicks takes great offence at being called a “failed candidate” in the story but is happy to put the boot into Kathy Jackson’s looks and family. The link goes to the post titled “Thomson 8: The HSU family”. Mr Wicks says in the post “Once again, I must stress that in no way am I saying that Jackson is guilty of anything. I am, however, looking forward to hearing her explanations for the transactions we have shown previously, and the ones we will expose in this article.” This is clearly contradicted by his other comments in other posts where his statements clearly show he thinks she is guilty. Well I am accusing Mr Wicks and Mr Thomson of criminal offences and I am looking forward to his explanations. Felicity Wicks‏@wicsworld Whether Craig Thomson is guilty or innocent is neither here nor there. We must Support innocence until proven guilty, please. Notice how Mrs Wicks supports Craig Thomson and drops the boot into Kathy Jackson. And this comes from a person who is apparently helping her “investigative blogger” husband. A person who has commented on my site for a while and uses the names Eric and Slick made a death threat against Kathy Jackson and me on this site in the comment section of the last post. I had written that I was about to do a post on Peter Wicks which upset Eric greatly. I was at work at the time and when I saw it when I came home deleted it. (Yes I have kept the copy) But it was seen by others. Eric is a big fan of Peter Wicks, the posts he has done on IA and Craig Thomson. Hi Dxxxxxxxd wishing somebody hit KJ and actually threatening to do it are twodifferent matters DxxxxxxD go on make your day ring the police DxxxxxxxD . Eric could just be a nutcase who has been following the matter closely. But given his comments overall which show he is very well-informed on the matter I believe he is somehow connected to someone involved. How did he know that I had phoned Peter Wicks? Was it a guess? I do not think so myself, someone has told him is what I think is more likely. Writing the posts that I do a death threat was always going to come because that is how the criminals work. Also Kathy Jackson had already received one last year so it is consistent with that. But that does not make it right, it is a criminal offence and no joke. Eric should be getting plenty of jail time. The evidence I have outlined above is just the tip of the iceberg and I could have written a lot more. There are plenty of questions that Peter Wicks, Craig Thomson and David Donovan need to answer as well as other who are involved. The ALP have a lot to answer for as well. Kathy Jackson should consider taking out an AVO or some other type of restraining order against Mr Wicks, Mr Thomson and IA. She might want to subpoena their phone records as well to see what has really been happening. Mr Wicks and IA have even published a photo of John Lawler and named him as Michael Lawler’s brother and the Commissioner of the Australian Crime Commission. This adds no value and potentially leaves him open to blackmail by criminals given that many members of his direct family have been named including children. What Mr Wicks and IA have done is something nobody should do but they must believe they can do what they want and are protected. Given Mr Wicks is an ALP member, past candidate for the state seat of Hawkesbury in the 2011 NSW election and possible future candidate, as he has stated to me, he should have kept right away from this because it automatically looks like perceived bias and when you look at the evidence it is real bias by him. Let alone the intimidation, harassment and stalking. The only thing he should have done is give what he had to the police which he says he has. He should have left it at that. I checked and Kathy Jackson’s 11 and 16 year old children’s names are still on the Independent Australia site in the post Peter Wicks did. But Peter Wicks does not like it when his phone number is on a site. Well Peter you know what my response is. ← Statutory Declarations show Bill Shorten and Stephen Conroy trying to put the political hit on Kathy Jackson. wow well done shane and if this eric guys gives you anymore problems then id be more then happy to go and take care of him the same way i did with Larry Pickering and to be honest wih you Shane only cowards do what eric has done so dont worry about it to much KEEP UP THE GOOD WORK M8 and with any luck the labor party and the rest of these maggots will be out of office really soon. Their is Not much lower than whale poo at the bottom of the sea! Thats where Thomsons camp is at the moment! I read this guys comments about Kathy Jackson a while ago after following the NAB corruption story to the IA site. I thought it a bit strange at the time as it seemed to completely contradict the evidence against Craig Thomson. Now it’s a bit clearer. Ironically, i read a lot of the comments over there and i felt them to be overly Labor centric. I didn’t smell right, seems my intuition was correct. It’s a shame i, i have sympathy for what Tess Lawrence has gone through at the hands of the NAB. However, i won’t be going back to Independent Australia again. Dear Glenn, I do thank you for what you have written about me. It means a lot. Yes you have picked the right legislation Shane (474.17 Crimes Act) as I have seen charges laid by NSW Police on this one. People get heated up writing on blogs etc, but no-one should threaten another – just not on. Perhaps you should contemplate seeking a Senate seat as an independent in the next federal election. You will probably get my vote the way you are going. As my old Mum said: democracy needs a stirrer on every committee. Just keep your integrity in place! No Shane don’t consider it. Once you are on the inside they will take you over or take you down. Our Government, our Colonial constitution, none of it legal/lawful anyway. They know this full well. Great work, Shane. These corrupt ALP thugs are destroying their own party and the Unions! Disgusting to threaten Jackson this way, but to drag anyones children into this case, is the lowest type of bullying, and I feel sure that the Honorable PM (who is so against BULLIES) will call them to order….especially Craig Thomson, who is SCUM! I AGREE, SHANE SHOULD STAND FOR THE SENATE HOW WONDERFUL IT WOULD BE TO HAVE A TRULY HONEST AND BRAVE AUSTRALIAN IN THE SENATE. HOW CAN SOMEONE LIKE CRAIG THOMSON CONTINUE TO RECEIVE NEARLY 200K A YEAR. CHARGES SHOULD HAVE BEEN LAID AFTER FWA FINDINGS. NOW WE HEAR HE HAS BEEN BEHAVING IN AN UNLAWFUL MANNER TOWARDS KATHY JACKSON. THEY WILL PAY A TERRIBLE PRICE FOR THEIR CONTEMPT OF THE MILLIONS OF HONEST AUSTRALIANS .THAT DAY CANNOT COME SOON ENOUGH. “Admit nothing, deny everything, make counter accusations” has always been the Labor Party ( and their camp followers ) mantra. And keep the focus on the Opposition Leader, no matter what we do, however stupid and/or corrupt. yep and they call Abbott and co., deniars. Keep up your gr8 work Shane. So sick of these grubs bullying, threatening, all thugs. We need whisleblowers to keep the bastards honest. Its fine for Albaslezey and Roxon to come out against Ashby, while it isgoing through the courts, but wow the hypocrosy if anyone dares blow the whistyle on labor or their thug unions. To bring up her children, really is a new sort of grubbiness. Dont hear labor bleaters come out saying anything to support Jackson wehen she was threatened…shovel, everyone should find this putrid behaviour on front page news. If it was Thomson theyd all be out in the media, what a travesty. powerful and stop at nothing. Shane just take care! Shocking stuff, though I’m not altogether surprised. Do these people ever get to court? The country and the unions are full of thugs. I despair…posting a link to this on facebook. Shane this is truley ugly stuff….This is not a surprise to me though, and I speak from personal experience. Following my very public efforts in 1999 to recover well over one million dollars. (This amount would be worth a lot more today). of Australian Workers Union (AWU) members money I was viciously assulted and left for dead. The cowards said to me as they all but kicked me to death why I was a target “keep your f…. mouth shut you c… and stay away from the press”. I was sent to hospital and the police were involved. Despite police efforts, including a public appea no one was ever charged. A bloke named Bruce Morton Wilson was an AWU official in the 1990s and his then lover Julia Gillard was a partner with law firm Slater and Gordon when Wilson defrauded and ripped the money from AWU members. Gillard was providing paid legal advice to Wilson at the time. (AWU members paid her accounts of course). I refer readers to previous well researched articles Shane has written about this on his site.As for me I continue to do whatever I can to expose the truth and bring the thieves to account. Not an easy task Nothing short of a Royal Commission will clean up the trade unions in this country. Bob Kernohan. This is unbelievable stuff, Bob, we’re in the wild west. I would have thought the Liberals would by now have picked up on Shane’s post but it seems they are neutralised by some other legal matters that prevent them from politcally demolishing PM Julia Gillard for corruption. Is there something that also links the Liberals to this mess? Wow, they certainly stick to their same MO don’t they. Anna Bligh tried in Qld to throw dirt on her opponents family members, but it pales in comparison to this guy naming children. What was his comment? They are not children anymore? If anyone did this or something similar to my children or family, it might push me from the law abiding side of things to doing something unlawful, and I’m sure many other people would feel the same way. How low can the Labor party go? If the courts can’t give us justice on this, what is the alternative? How does one instigate a Royal Commission? “In her email, dated September 29 last year, Ms Kershaw alleges Ms Jackson would deposit money from the union into Ms Kershaw’s account and then ask for it to be given to her. Ms Kershaw, who sent the email after Ms Jackson instigated a police investigation about corruption within the union, also said she fobbed police off by saying she was going overseas straight away, when she really wanted to consult a lawyer before she spoke to the police again. Peter Wicks produces a document showing a payment of $28,000 to Ruth Kershaw – as well as many other mysterious sums for mysterious services. And you want Peter Wicks to go to jail for mentioning the ages of her children? What strange moral planet do you come from? You are missing the point of the post. You seem to think mentioning children online for no reason but to harass and intimidate is OK. So please do not question my morals as you clearly have none. Mr Wicks says he has given the evidence to the police yet decides to harass Kathy Jackson and her children. Have a look at his posts, they are not journalism. They are words coming from a stalker in defence of Craig Thomson who he says there is no evidence against. That would the moral planet where the age old practice of ,when accused, trying to discredit the accuser rather than attempt to answer to the accusations is not highly regarded. I don’t think anyone is convinced Ms Jackson is a complete clean skin here either but most suspect her indiscretions are not in the same league as those of Craig Thomson and Michael Williamson whose behaviour Labor and it supporters have been trying so hard to keep concealed . I think most people know she is cleaner and alot cleaner than most in the union. Anyone that whistleblows to the scale Kathy Jackson has done must have integrity and if it is revealed she has done wrong, well I will confess I have a drink driving conviction but does that stop me from dobbing in a thief? …..”cheat and lie”, bribe the gullible with ‘benefits’, pay-off the nosey, rig contracts for their mates without going to tender, dissolve national borders resulting in ever-so-grateful future constituents, swell the ranks of the Public Service (another captive constituency), create enough phoney ‘green’ jobs for their union buddies – after all, who would vote their most lucrative meal-tickets out of office? Not to mention their past track record of casting multiple votes which can never be traced or rendered void. A great case for a fresh electoral system where photo-ID is necessary to register on the rolls and to cast a vote. There is a real danger that all these factors, while relatively small in number individually, can result in the winning of marginal seats – and enough of them to put these pirates back in the wheelhouse of the great ship ‘Terra Australis’. Meanwhile, the unmitigated thuggery of the likes of Wicks will continue unabated because they are accountable to nobody. Organised Crime works that way. But how do we get a Royal Commission and should we not have one now? i noticed nothing but silence from their camp. i can imagine now they are consulting lawyers (probably at taxpayer’s expense) and dare not say anything for fear of incriminating themselves (except for one twisted post trying to make out that the naming of the kids is the central issue, and again pointing the finger at KJ). so eric, was i right about IA being a poison tentacle of the ALP/unions? was i right to assume that you are helping them and/or a silly fool too blind to see the truth? i think so given what shane has uncovered. shane, i wasn’t sure who he made the death threat against, but ultimately it doesn’t matter. perhaps you should make a formal complaint to police and have “eric” investigated and charged – it may well uncover much more than what you already have. it would be another massive criminal cover up if he were not charged. keep on exposing them. “474.17 of the 1995 Criminal Code: Using a carriage service to menace, harass or cause offence” – a know of a case when the NSW Police charged a person over this and I think Shane should do the same concerning this “Eric”. Very happy to have someone to tell me what is happening Shane. Have bought & read your book, although it had to come from overseas. Proud to be a follower of our website, will stand together with all others behind you. Just read some posts on your website for the 1st time – very impressed!! I can taste the truth & it is very refreshing. I used to read Peter Wick’s blog, he did some good work exposing Kathy Jackson, but could not or perhaps wouldn’t explore further her allegations that she was offered a seat in the Victorian parliament. (Last time, I checked we had a democratic political system which does not include former senators handing seats out like lollies?). To my knowledge this offer was never denied, and it is the architect of that offer who has some serious questions to answer about this whole sorry drawn out saga, (By the way, does anyone know who got that seat, or whose spouse they are?). The wheels of justice turn slowly, they will catch up with the grubs eventually. It stinks, they stink and everyone will know.